Offer your feathered friends a stately and durable roost by placing this Heartwood The Charleston Bird House with Verdigris Roof in your yard. The bright white color and soft green roof on this generous, striking abode are sure to add an elegant look to your landscaping, perfectly celebrating southern hospitality. Cellular PVC forms the body of the shelter, and remains resistant to rot and insects for a lasting abode. The four sided, copper roof brings wonderful height to this unit, and its verdigris finish lends it an aged look, while a cast iron finial completes the piece. Birds access the interior through the 1.5" diameter entry hole, and an ornate lading platform beneath it offers them a small perching spot. Drainage and ventilation built in to the piece keep it dry and cool for your feathered friends. Scrolls on the extended base create a delicate hint on the unit, and this sleeve slides easily over a 4 x 4 post for a remarkable display. The cellular PVC body retains its lovely white tone for many seasons, and its tall shape forms a garden centerpiece. 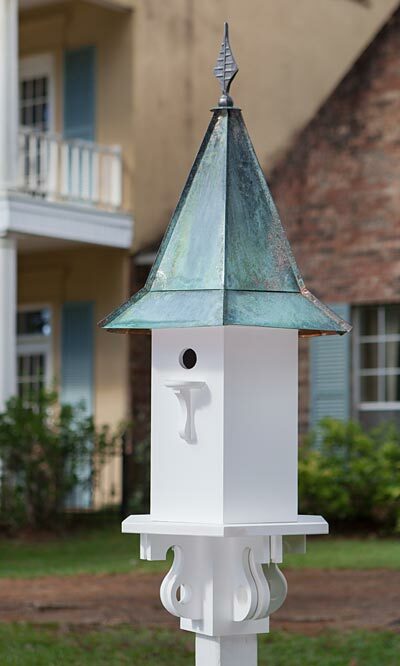 Welcome birds to roost in your yard in The Charleston Bird House with Verdigris Roof. Some assembly required. Made in the USA.